Double your Powerlink outputs, or Daisy-chain your speakers! Connect two Beolab active loudspeakers to a single RJ45 Powerlink socket on your Bang & Olufsen Playmaker, BeoVision, BeoPlay V1, and the newer B&O products. With our Powerlink compatible "Y" Splitter you can now connect two Beolab active loudspeakers to a single Powerlink socket on your Bang and Olufsen Playmaker, BeoVision, BeoPlay V1, and other new B&O products! This cable will fit all recent B&O Powerlink RJ45 sockets (2013+ models with RJ45 "Ethernet" Powerlink type sockets). 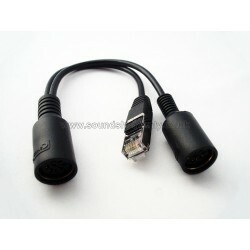 For traditional 8 pin DIN Powerlink devices please see our 8 Pin Powerlink compatible Splitter instead. If you are in any doubt, please ask! Just want to convert between Powerlink types instead? Try our RJ45 to Powerlink compatible adapters - small clip on adapters that let you convert between traditional and modern Powerlink types! This 0.2m cable is fully-wired, making it suitable for ALL Beolab speakers with RJ45 Powerlink sockets, ie. all of the current range of Bang and Olufsen Beolab active loudspeakers and BeoVision TVs. Fully wired mk.2 Powerlink - for use will all Powerlink equipped speakers including Beolab 5, 50 and 90. This cable is especially useful for doubling your Playmaker output sockets. Since both left and right audio signals are present in each Powerlink socket, only one adapter cable is need to connect both left and right speakers to one Powerlink socket.